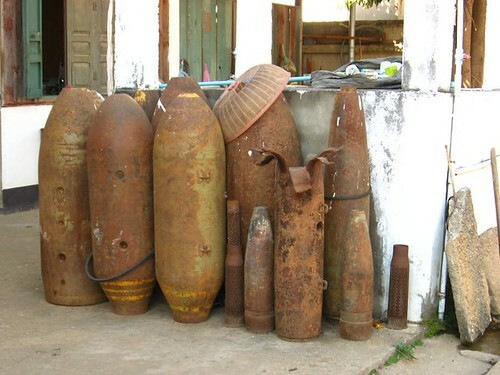 One thing which is not changing fast enough is the clearance of unexploded ordnance left over from the war. During the Vietnam War, fighting spilled over into Laos. Although there were ground battles in Xieng Khouang and Huaphan, as a result of a civil war between the Pathet Lao and the Royal Lao Government, Lao was supposed to be neutral, not a part of the US vs. Vietnam effort. However, the US provided support to the Royalist side and to the Hmong supporting them, in air support. Bombing raids also targeted the 'Ho Chi Minh Trail' in the south of the country. Most people have the image of a superhighway running along the eastern side of the country, but in fact, the supply chain ran along already existing roads and footpaths. Carpet bombing did little to cut the route because people would use detours. While some supplies were transported by trucks during the night, most of the supplies were carried on bicycle pushed along the road. I have seen an example of one of these bicycles - with extensions on the handlebars so it could be steered, loaded up with 300 kgs. of rice, medical supplies, weapons and artillery shells. There are many more examples of unexploded ordnance under the ground throughout the country.